Rapid tumour lysis can release harmful metabolites at a rate that exceeds the kidney’s excretory capacity resulting in a metabolic syndrome known as tumour lysis syndrome (TLS). TLS is a complex of hyperkalaemia, hyperuricaemia, hypocalcaemia, hyperphosphatamia and lactic acidosis. It is most commonly seen in high-grade malignancies (leukaemia, high grade lymphomas and testicular tumours), usually following therapy but occasionally spontaneously. The metabolites are released too fast as may be seen with tumours that are very sensitive to chemotherapy. The metabolites are released in a large amount as may happen with a large tumour. The kidney function is compromised. The common tumours associated with tumour lysis syndrome are lymphoid malignancies (Burkitt’s lymphoma and other high grade lymphomas, acute lymphoblastic leukaemia) and other acute leukaemias. These tumours have a high proliferation rate and are very sensitive to chemotherapy. As leukaemias do not present with a tumour the malignant cell load in leukaemias is not fully appreciated. The bone marrow is about 4% the body mass. A 72kg patient who has 30% blasts would have about one kg of tumour in the bone marrow. Lymphoid neoplasia also involve the spleen and liver and have a greater cell load than myeloid leukaemia. Lymphoid leukaemias are also more sensitive to chemotherapy than myeloid leukaemias and undergo a more rapid lysis. This makes patients of high grade lymphoid malignancy most prone to TLS. Chronic myelocytic leukaemia treated with imatinib. Renal Cell carcinoma treated with sunitinib (Invest New Drugs. 2010 Oct;28(5):690-3). All the above situations are characterised by a rapid tumour response accompanied by a release of metabolites at a rate the kidneys can not cope up with. One needs to keep the possibility of TLS in every patient with a large tumour and/or a chemosensitive tumour treated with very active drugs. Many of these patients present with non-specific manifestations. Cell lysis releases intracellular contents including potassium, phosphates, purines and lactic acid. Purines are metabolised to uric acid by a pathway needing xanthine oxidase. Uric acid precipitated in the renal tubules causing renal failure. Phosphate released by cells chelates calcium causing hypocalcaemia. 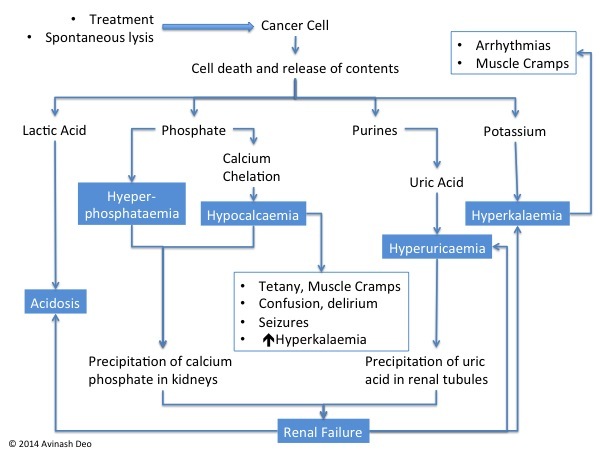 Precipitations of calcium phosphate in the kidney adds to the renal failure caused by precipitation of uric acid. Hypocalcaemia causes tetany, muscle cramps, rarely seizures and enhances the arrhythmogenic effect of hyperkalaemia. Lactic acid release causes acidosis. Hyperkalaemia resulting from release of intracellular potassium causes arrhythmias and muscle cramps. Renal failure increases hyperkalaemia and hypocalcaemia enhances the arrhythmogenic effect of hyperkalaemia. High volume disease: Patines with high blood counts and/or pronounced organomegaly or elevated LDH are more prone to TLS. Hydration with about 3000ml/day should be started 24 hours before starting chemotherapy. Alkalinization of urine to promote ionisation of uric acid and improve it’s solubility is controversial. The pKa of uric acid is 5.4. About 90% of uric acid exists as sodium urate at a pH of 6.5. Increasing the pH any further will not increase solubility significantly. On the other hand calcium phosphate becomes less soluble with increasing pH. Alkalinization can cause precipitation of calcium phosphate in the tubules. Alkalinization can also worsen hypocalcaemia. Measure to reduce uric acid: Purines are converted to xanthine. Xanthine is converted to uric acid by xanthine oxidase. Allopurinol inhibits xanthine oxidase and prevents conversion of xanthine to uric acid. Xanthine is more soluble than uric acid and does not precipitate. Allopurinol prevents formation of uric acid. It has no effect on the elimination of uric acid. Urate oxidase converts uric acid to soluble metabolites and may be used in patients who do not respond to allopurinol or those who thought to be at high risk of TLS. Close monitoring of patients early in induction therapy for metabolic defects and instituting therapy to correct these defects at the earliest. Other measures include use of calcium gluconate, sodium bicarbonate, glucose-insulin drip, beta-2 agonist aerosols and dialysis. Hyperphosphataemia is treated with aggressive hydration, phosphate restriction, oral phosphate binders and dialysis if necessary. Hyperuricaemia is treated with allopurinol, urate oxidase and hydration.